We are a fresh team in the timeworn game of residential real estate – and we’re growing. We are forward thinking; we know this industry is changing rapidly and we don’t just want to ride the tides of change, we want to affect it. How do we do that? Well, we need people like you. Your ‘Yes if’ rather than ‘No because’ attitude allows you to make significant impact on how we run our business. At the end of the day our business is made up of the people in it and their ideas, their values. No idea is immaterial, or too big to tackle. If you believe it will make a difference, so do we. Everyone here is working towards the same goal: to have a business that supports their lifestyle, a business that works for them instead of the other way around. Sound like something you can manage? 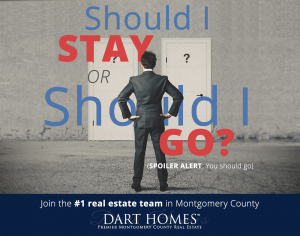 At both the beginning and the end of the day, you will be the face of Dart Homes. This is more than just showing and listing homes – all of our future friends and family will rely on you to be their trusted advisor, their most valuable asset. And for us at Dart Homes, that makes you our most valuable asset.